Sokoto state governor, Aminu Tambuwal, today picked up the presidential nomination form of the Peoples Democratic Party (PDP). 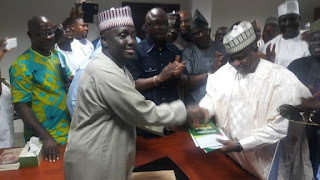 Tambuwal who defected from the ruling APC to PDP on August 1st, stormed the Wadata Plaza headquarters of the opposition party in Abuja with his supporters this evening to pick up the nomination form. Tambuwal alongside Bukola Saraki, Atiku Abubakar, Rabiu Kwankwaso, Sule Lamido, Ibrahim Dankwambo would be vying for the PDP presidential ticket at the primaries holding on October 6th.